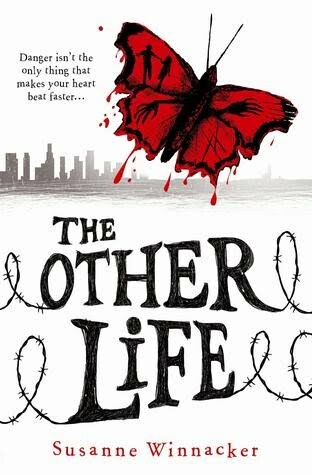 The Other Life: who we were before the virus. How we'll never be again. It's been 3 years, 1 month, 1 week and 6 days since Sherry has seen daylight. When things went wrong up above, she was sealed off from the world in a bunker with her family. But when they run out of food, Sherry and her dad must venture outside. There they find devastation, desolation...and the Weepers: savage mutant killers. When her dad is snatched, Sherry joins forces with gorgeous but troubled Joshua - an Avenger, determined to destroy the Weepers. But can Sherry keep her family and Joshua safe, when his desire for vengeance threatens them all? At the start of the book, the author quietly builds up the tension and the curiosity levels by introducing us to Sherry and her family, who are locked in the bunker in the basement of their house. It has been three years since they last saw daylight and lost all contact with the world. At this point, everything has just got too much and the family are at boiling point, especially when they run out of food. This is when the story becomes really interesting and exciting as Sherry and her father leave the bunker to find food. . . . As a result of this action, we suddenly become thrown into a post-apocalyptic world with rabies-infested humans known as Weepers. Whilst they are perhaps described with vague detail, the very vicious nature of them certainly allows the magic to spark in the imagination department. I have to say that I did find Sherry (one of the main characters) slightly annoying. I did try really hard to overlook this and felt that I just about managed it. It was not her OCD traits, in fact I found this element fascinating, it was actually the dialogue that she engaged in. At times, I found this confusing - she asked too many questions and, like all of the other characters, she appeared to be rather too stereotypical. Whilst the little snippets of her former life weaved throughout the story were clever, I'm not sure that they really worked. This book has a real emotional depth to it - the feelings portrayed through the characters make the story more convincing. The supporting characters all portray a different story with different feelings as they learn to cope and survive. This worked amazingly well as it is often difficult to get the balance just right. I think that this is a great debut book. It is very readable and will certainly have you, in parts, hiding behind the covers and wanting to read faster in order to find out more. The ending was great - it sets up the next book to be even better. Perhaps the characters may have more to fight than just the Weepers . . . . If you love dystopian and zombies, then this will be a book just for you and if you don't, then give it a try anyway. The Life Beyond will be the next book and I just can't wait. What age group is this book for? Thanks. I normal put the age group on my book reviews,but not on this occasion. I would say 13 years and over as it's labeled YA. Snap - Let's see what happens in the next book.